First off, let’s start by giving a definition to the concept. Guest posting or guest blogging means writing articles, blog posts, infographics (and many other types of content) and posting them on other websites than your own. It is important to keep in mind that not all blogs accept guest posts and that they have certain guidelines you need to follow. Guest blogging is not a new trend. Statistics show that most marketers have this strategy in their portfolio. In a recent survey, more than 60% of responders stated that they write 1-5 guest posts per month. Although it might seem like an easy solution to gather backlinks to your website, you need to see guest blogging as a well-made strategy, and not as a short route. You can’t just start writing and sending your work to any website you find. The most important part of a content distribution strategy is research. Begin with websites in your line of work that accept guest posts. For instance, if you have a content marketing blog, search for websites that write about marketing. Once you gain popularity, you can try out more specific websites. Another thing to consider when choosing a blog to post on is their Domain Authority(DA). Of course, you want it to be bigger than yours. It is best to look for websites that have at least 60 DA. If you don’t know how to check for DA and Page Authority (PA), you can try out Moz. I know it might sound like an unimportant part of the process. However, webmasters want to see that the people who write on their website are up for the task. Also, a great bio with a link to your website can help you increase traffic on your blog. A well-written bio should contain your field of work, some of your most recent projects (or companies you’ve worked for) and some work samples. Once you made a list of websites you want to post on, you’ll need to choose some topics. Start with general topics (like social media marketing) and then proceed to look for niche subjects. Don’t write general articles. They will look like fluff, and nobody will end up reading them. Try a hands-on approach for every article you write. Explain and give as many examples as possible to help the readers, instead of confusing them even further. After you completed the steps above, you need to decide what type of content you want to create. There are certain templates which attract the eye of the users. For instance, X tips and tricks and Ultimate guides are some of the most popular ones. Now is your chance to impress the webmasters (or die trying). A pitch needs to contain main ideas from your article, why you chose this subject, and the type of content you want to post. Don’t forget to include a link to your website (the one you want to insert in the article) so that the webmaster can review your past work as well. Never send an entire article or presentation instead of a pitch. Webmasters receive hundreds of pitch ideas per day. They don’t have time to read thousands of words per day. Just send the essence of the article and wait for their response. It might be good to send them a reminder every once in a while to make sure that you get a response. Now that you’ve completed all these steps and you received approval from the webmaster, you’ll need to start the creation process. We’ll give you some general guidelines which will help you please the webmaster while still preserving your style. Every website has a specific tone of voice. They expect you to identify their style and write in a similar manner. If you send them an article where you used a different style or tone of voice, they might reject it. Also, statistics show that a friendly, informal tone of voice can increase engagement because people can relate to the author. 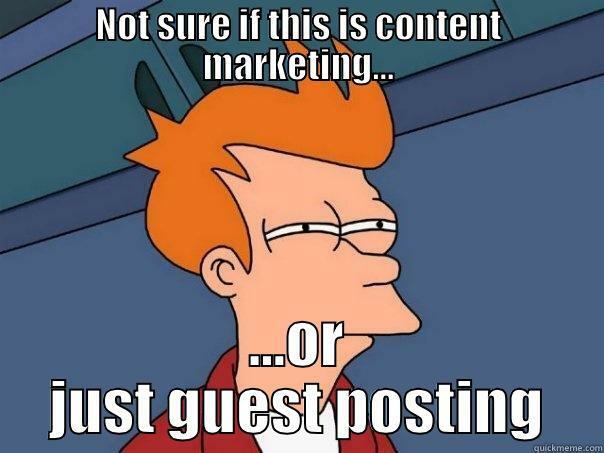 The main reason for writing guest posts is to attract people to your website. You’ll need to include a link to one of your articles, products, or reviews in the second paragraph of your guest post. To avoid looking spammy with just one link and that being your own website, you’ll have to include links to other websites (with a Domain Authority over 75) that have also addressed the same subject. For instance, if you have an article about content marketing, you can include a link to an article that speaks about content distribution. The best proportion is 1 link from your website at the beginning and 2 other links in the middle and near the end. You will need to talk to the webmaster and figure out a word count target that works for both of you. Consider how many words you need to express your ideas, but take into account that users have a very short attention span. Not everyone will read 1500+ words from the beginning till end. However, you will also need to take into account general SEO guidelines. Articles with less than 600 words are not very SEO-friendly. Try to aim for at least 800-1000 words per article. There is a whole fuss around the best word count for Google. Statistics show that guides with more than 3000 words are more likely to be shared. On the other hand, articles that have around 1000 words are more likely to be read and to please Google. When you researched for websites to post your work on, you probably stumbled upon a long list of guidelines on each one of those sites. We advise you to follow each and every one of them. They are actually posted there to help you understand their users and how to write something they will appreciate. The link that brings users back to your website needs to be relevant. You don’t want to write about the ten best video cameras and link to an article about five TV sets. This will send your bounce rate off the charts. Always link to content that brings more useful information to the reader about the SAME topic. Share the content on social media. This is an amazing opportunity to promote both the host website and your article. They get more traffic, you get more traffic, everybody gets more traffic! Thank the host website for letting you share your work with their users. You will establish a relationship with the webmaster (which will make it easier for you to write for them again) and you will once again promote your work and their website. Follow up on your work. Your job is not done once the guest post has been published. That is just the beginning. You need to be able to monitor the engagement rate and to answer all comments. While answering comments, you can also add another link to one of your articles if you find it relevant.